Large balcony overlooking a landscaped grounds and lagoon. The white sands of the the Caribbean a short stroll away. We can put you there. The Grand Mayan Riviera Maya complex arranged around a man made lagoon right over the dune from the Caribbean has been there just long enough for the landscaping to mature. 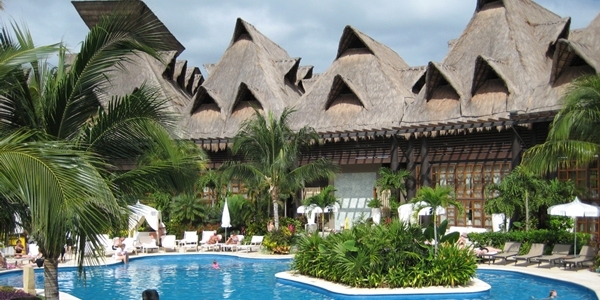 The Mayan Palace resorts were the original units and are still top quality accommodations. The Grand Mayan offers a step up from that high standard. Relax in your own small hot tub right in your room, cool off in the mini-pool right on your spacious balcony, or just relax in the elegantly appointed 1200 plus square feet of your 2 bedroom suite. private balcony and more spacious, elegantly decorated rooms. Want more detail? Check out the links at the top of the page for golf, accommodations, transportation/maps. We make timeshare rental easy and affordable for you. We have developed partnerships with well over two hundred timeshare owners, just so you can rent their spare weeks at the Grand Mayan Riviera Maya. Because you are a guest of an owner, free transportation to the resort is provided (but not back to the airport) The Riviera Maya resort lays claim the most extensive pool in Latin America. The new Grand Mayan complex adds a private Grand Mayan pool area to this with a full waterpark coming soon. The one and two bedroom suites are for those whom extra elbow room and elegance are not optional. All this in a perfect Riviera Maya setting!